Domestic rats, bred and raised to be friendly and gentle, are held in high esteem by pet owners around the world. However, due to many people’s aversion to wild rats, this fairly low-maintenance, low-cost and intelligent pet often is overlooked, Rolnick said. Even a glimpse of a rat’s long, bald tail is enough to give some people the creeps. Two of Shea Rolnick's pet rats play in their cage on Jan. 9, at her home in Winterport. 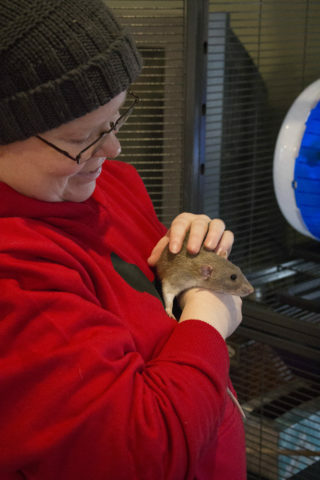 Levine is the intake coordinator for Mainely Rat Rescue, a nonprofit organization that finds new homes for abandoned or surrendered pet rats. Founded in 2007 by a group of rat owners in southern Maine, the organization has expanded to serve much of the Northeast. Before Levine began working for the organization in 2015, she never owned a rat. Now she has several, and she fosters rescued rats until they can find permanent homes. So far, she’s found them to be great pets for her family. If socialized from birth, domestic rats — also known as “fancy rats” — are usually friendly toward people and are less likely to bite than other small animals, such as hamsters and gerbils, Levine said. They usually are more eager to play and be handled, often greeting their owners when they approach the cage. Shea Rolnick holds one of her pet rats, Minerva, on Jan. 9, at her home in Winterport. Pet rats, Levine said, are known for perching on their owners’ shoulders to get a good view of the world. However, they all have different personalities. Some are curious and love to explore. Some are highly food motivated and therefore easy to teach tricks for a tasty reward. And some are snugglers, apt to curl up on your chest like a cat while you watch a movie. Now an advocate for pet rats, Levine sometimes wears a sweatshirt that reads, “Got rats?” And often, the shirt will inspire comments, especially from people who have a strong dislike of rats. But she doesn’t let it bother her. Sometimes she will take the opportunity to explain to the commenter the difference between domestic rats and the wild rats you see roaming the alleys of New York, digging through trash and lurking in the sewer. Are rats really that smart? Rats are so intelligent that people actually debate whether they are smarter than dogs. However, the cognitive capabilities of the two species are difficult to compare. Rats have front feet that function more like human hands, with long digits that can easily grasp and carry objects. This allows them to perform tricks that seem especially human-like and intelligent. Because most rats can be motivated by food, it is fairly simple to teach them to perform various tricks, and there are a multitude of rat trick videos available online to help. In addition to learning complex tricks, rats can problem solve and recall details, as shown in countless studies that involve rats navigating mazes. Studies also have uncovered that rats dream, are ticklish and behave in ways that could indicate empathy for their fellow rats. When you purchase or adopt a rat as a pet, it is important to know that the animal was bred to be a pet. In many cases, people purchase their first rats at pet stores, Levine said, and sometimes those rats were bred to be snake food, not pets. There’s a big difference, though they are the same species. 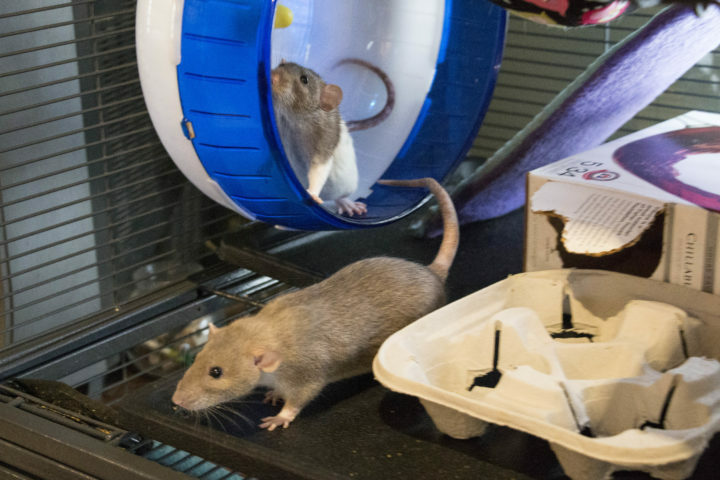 To help people find the ideal rats for them, Mainely Rat Rescue sends the rats they receive to foster homes that then work to learn more about each rat’s personality. These traits are then listed in the rat’s profile for prospective adopters to read. Mainely Rat Rescue typically adopts out rats in pairs or more because rats are social animals and usually will not thrive if living alone, even if they are given plenty of attention by their owner. Adoption fees range from $8 to $80, depending on the age of the rat and whether it’s neutered or spayed. Domestic rats are often purchased from breeders, which are located all over the country and include The Ladybug Rattery in Acton and the Maineiac Mischief Rattery in Newport, New Hampshire. Another thing that some rat owners take into consideration is the rat’s physical appearance, which can vary greatly. Rats come in all sorts of colors and patterns, even within the same litter. Their fur can be different textures, and their ears can vary. While “standard” rat ears are round and sit on top of a rat’s head, “dumbo” ears sit on the e of the head. And there are also tailless and hairless rats. You can learn more about these physical rat characteristics from American Fancy Rat and Mouse Association, which was founded in 1983 for people interested in rats or mice. Minerva the rat snacks on a piece of spaghetti. 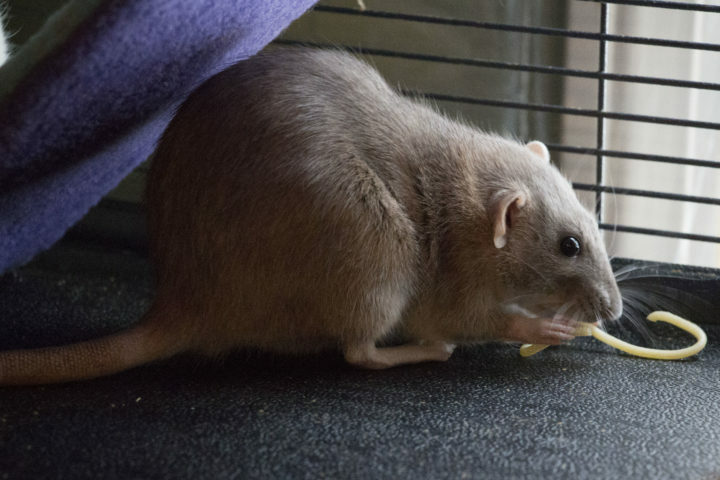 While her meals consist of food specifically formulated for domestic rats, her owner offers her a variety of treats, and spaghetti is one of her favorites. 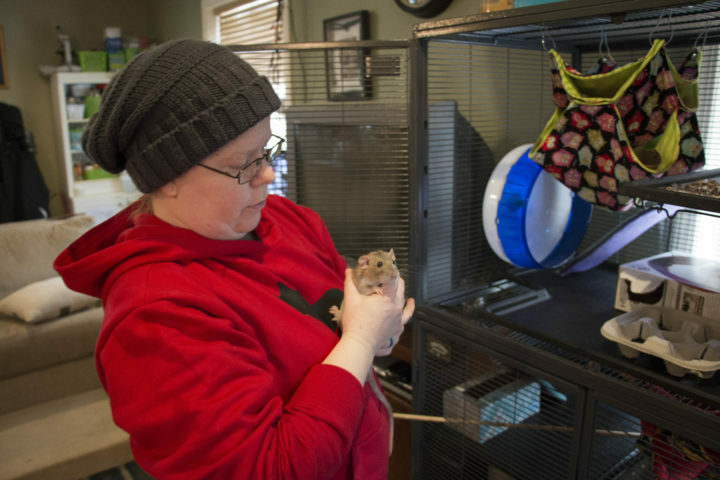 Jen Pittis, a nurse in Bangor, has owned several rats over the years, starting when she was in eighth grade. She’s had Vanilla and Beam, Mocha and Java, Cocoa and Fluff, and Christina Yang and Meredith Grey. And all of them knew their names, she said. Owning a rat is like owning a small dog or cat, she said. They crave attention. However, unlike a cat or dog, rats must be kept caged when unattended. They’re far too small and destructive to be allowed to roam free, and they can easily be injured or killed by other household pets. To give rats more freedom and stimulation, some rat owners set up a rat-friendly space for them to explore and learn tricks. At her home in Winterport, Rolnick has rat-proofed a bedroom where she can set her four rats free to play. “They give us hours of enjoyment just watching them doing their thing,” Rolnick said. For their cage, Rolnick invested in one of the best: a Midwest Deluxe Critter Nation, which is a large wire cage that costs about $250 and has four stories. A step from that would be the single Critter Nation, retailing for about $150, and the $80 Rat Manor. One of Shea Rolnick's pet rats uses its litter box, which is located in its cage. Domestic rats are often litter trained so they don't leave waste all over their cage. And like other small animals, rats require a feed bowl, rat food, a water bottle, and a place to sleep and play. 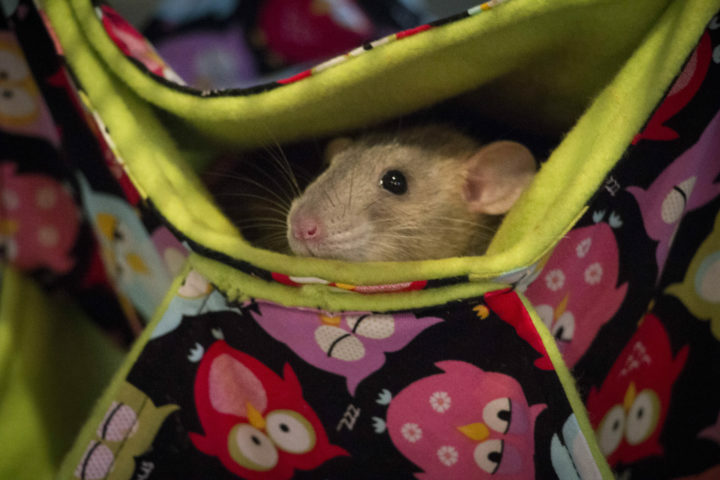 Rolnick’s cage includes fleece hammocks made specifically for rats, as well as an igloo-shaped shelter, a 12-inch exercise wheel and several cardboard items for them to chew on. She also covers the ramps in her cage with fabric sleeves so her rats don’t get their feet stuck in the bars as they climb between stories. And she has two litter boxes, filled with rat litter, located in one corner of the cage, well away from their food bowl. On average, domestic rats live to be 2 or 3 years old. Common health issues include tumors, especially among females, as well as respiratory infections. 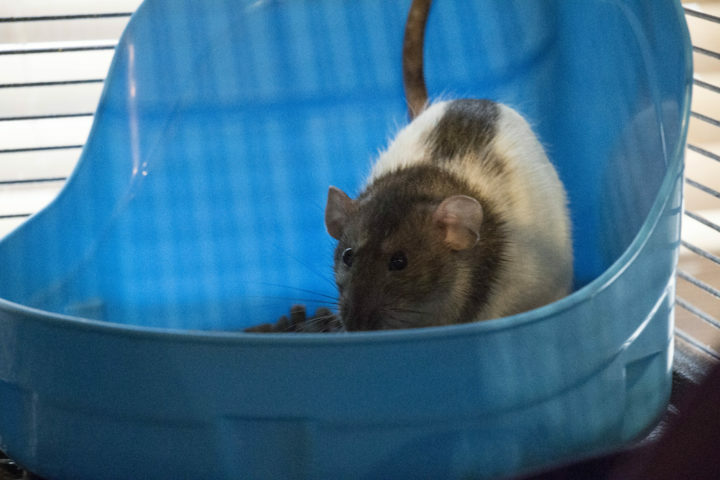 To minimize your rat’s chance of developing respiratory issues, Levine suggests cleaning its cage often and refraining from spraying air fresheners or other substances in the air around the cage. She also suggests finding a local veterinarian that treats rats. Not all small animal vets will take rats. In some cases, you may need to seek out the nearest exotic animal vet instead. Because rats have a short life span, they are a great animal for people who are not sure where they will be in 5 years. But be forewarned, once you take home your first pair of rats, you may not be able to stop, Levine said.